On 14 June 2017 SedNet published its policy brief “Effective river basin management needs to include sediment”. 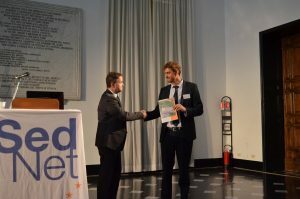 During the 10th International SedNet conference in Genoa a first copy of the policy brief was handed over by Marc Eisma, chairman of SedNet, to Raimund Mair of EC-DG ENV – Water Unit, with the request to spread the document to his EC colleagues. In the coming period SedNet will disseminate the policy brief to European River Basin Commissions and other stakeholders. The Portuguese Environment Agency [http://www.apambiente.pt/index.php?ref=x178] will develop in a short notice a project to evaluate sediment sources offshore (between -20m CD (closure depth) to -35m CD) to identify borrow areas for high magnitude beach nourishment operations in the western coast of Portugal. The project, designated CHIMERA, is part of the ongoing sediment management strategy and policy, assuming the replacement of the sediment budget as the main coastal protection measure in areas with large background erosion. For the project “Sullied Sediments” which started in January 2017, the work group on Applied Aquatic Toxicology (AAT) at the Hamburg University of Applied Sciences (HAW) is looking for a highly motivated individual with a degree in biology or environmental sciences (or a comparable field) and, ideally, some experience in the following areas: ecotoxicology, microbiology, environmental toxicology. “Sullied Sediments” is an EU-Interreg-Project with 13 partners, coordinated by the University of Hull, and aims at an improved assessment, treatment and protection of freshwater sediments, especially with regard to EU-watch list chemicals. The AATs major focus within the project will be ecotoxicological testing and evaluation of biotest results in combination with chemical data and in close cooperation with national and international partners. It concerns a half time position starting at the soonest possible date. The position will end on December 31, 2019. Deadline for application is 17 March 2017. Position available at the University of Leeds (postdoctoral level) to work on a newly awarded project iCASP – Yorkshire Integrated Catchment Solutions Programme – (~ £5million NERC funded); 5 years duration, application deadline 19th of March 2017. This is a research position on the socio-economics of catchment solutions. The appointed person will work on assessing the benefits of catchment solutions based on robust natural science-base. The appointed person will engage extensively with natural scientists and non-academic partners, but will also have the opportunity to develop cutting-edge socio-economic research. An impact officer will support the appointed person on its role. GLOBAQUA (Managing the effects of multiple stressors on aquatic ecosystems under water scarcity) is an EU-funded project aiming to identify the prevalence of, and interaction between, stressors under water scarcity in order to improve knowledge of relationships between multiple stressors and to improve water management practices and policies. Here you can find the latest issue of the GLOBAQUA newsletter which describes the main scientific results achieved so far, the main outcomes of its public events as well as key news from case studies and the most relevant forthcoming events. If you have any comments or would like to share your point of view you can contact www.globaqua-project.eu. This year a prize of AU$200,000 will be awarded for outstanding achievements in sustainable river basin management. Any organisation or partnership who has implemented a successful program of activities benefiting a river, lake, wetland or estuary, in any part of the world, is encouraged to apply. The winner of the Thiess International Riverprize will be announced at the 19th International Riversymposium in Brisbane, Australia, on 19 September 2017. Applications can be made online through the IRF website and stage one of the application must be completed by 24 March 2017. 115 abstracts have been submitted! In the next couple of weeks the abstracts will be judged by the SedNet Steering Group. Everyone who submitted an abstract will be informed of the outcome by early March. The preliminary conference programme will be published soon after this process. LIEC, CNRS-Université de Lorraine, Vandoeuvre-les-Nancy, France, have a Post-Doc position available on Mineralogy/Environmental Geochemistry. Skills Required: X-ray diffraction, synchrotron related spectroscopies and microscopies, Rietveld refinement. For a detailed description see Postdoc MOBISED_region2017.